Ps2 slim power supply 8.5V. Condition is Used. Dispatched with Royal Mail 2nd Class. Excellent condition. Tested and working. Item is original Sony unit and has been tested and is fully working. PICTURES IS THE ACTUAL CONDITION. UK 100- 240V. Sony Mains AC Power Supply Cord Adapter for PS2 7000 series Slim Console. Condition is Used. Dispatched with Royal Mail 2nd Class. Tested & Working. In Good Condition -. The power supply from PSBasics is ideal as a replacement power supply or second power supply and fit for any version of the thin console. The total cable length is approx. 250 cm. 2 X SONY ADAPTERS ALL WORKING FINE AND READY TO SEND. AV Video Audio TV Scart Cable Lead Plug/Power Supply for PS2 Playstation Console. Condition is Used. Dispatched with Royal Mail 2nd Class. Please check my other items. Thanks for looking and happy bidding! 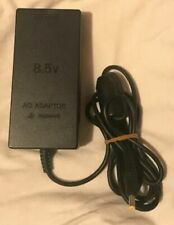 Sony Mains AC Power Supply Cord Adapter for PS2 Slim Console. Condition is Used. Dispatched with Royal Mail 2nd Class. We have fully tested this and its working well. Supplies power to your player Console. Output: DC 8.5V--5.6A. We will always here to solve them for you. It won't help the problem to be solved. We are based in Finsbury Park. Original item. We do free diagnoses and we fix on "No Fix, No Fee" basis. Model PlayStation 2 - Slim. Platform Sony PlayStation 2. Type Power Cables/Adapters / AV. NON CONTINENTAL USA AK / HI / PR / APO / FPO / & OTHER US TERRITORIES. Features: 1.Supplies power to your player Console. 2.Provides your PS2 70000 console with consistent power with this portable AC adapter. 3.Perfect replacement for lost or broken systems for PlayStation2. 4. Includes AC Adapter and power cord 5. Easy to use at home, in a hotel, on a trip. The Adaptor is in complete working order. Make Supersized seem small. in good working condition. Pattern picture! Item may differ from the photo. The Konsolenkost-Team wishes you a lot of fun. Item may differ from the photo. Our service for you! Item condition Condition of Use. South Korea.